These days, you don't have to spend a fortune to find good cosmetics - whether they be in terms of quality, colour selection or staying power, the competition at the lower end of the market is heating up and you definitely can find value for money if you know where to look (and thankfully they are not too hard to find either!). One such product comes from BYS. Their latest release is a collection of blush trios and being a sucker for palettes, I thought I'd give them a try. My previous foray with BYS until this week have only been their nail polishes. I've now discovered that they has reformulated and revamped many of their makeup offering and have a full line of cosmetics ranging from foundation to blushes, lipsticks, eye shadows and liners. There are four trios in this collection. From top to bottom L-R: Coral Me in for a coral pink/red based trio, Endless Summer a peachy pink collection, On the brightside, a collection of vibrant pinks and Heart Skipped a Beat for some dusty pale pink and lilac shades. The one that landed on my desk to swatch for you today is is the bright and vibrant palette aptly called "On the Brightside". First up, I have to say I adore the shades of this palette, they are beautiful bright colours that are perfect for making cheeks pop. 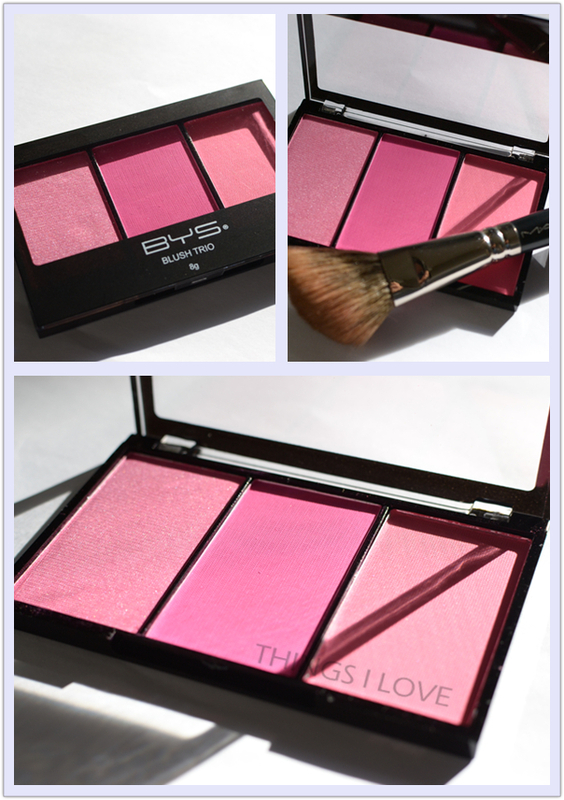 On the left of the palette is a berry pink with micro shimmer that looks beautiful on its own and gives skin a glowy sheen. 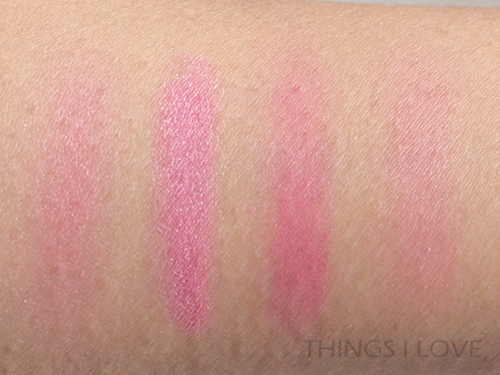 The middle shade is a matte hot pink and the right shade a cooler matte pink. Blended, the three shades come together nicely to create a pretty warm pink shade that gives skin a healthy sheen (left swatch below). 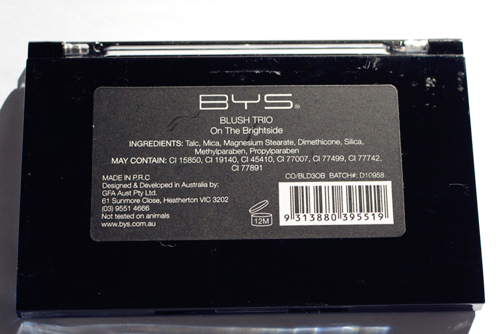 The packaging is a sturdy albeit thin black plastic case with a clear top window to show the colours underneath. Inside sits three large (and I mean LARGE) colour rectangles in your chosen colour palette (you won't be running out on these for a very long time let me tell you!). These trios don't come with a travel brush but isn't missed as most included brushes are pretty useless and thrown out by me anyway. Texture wise, the shimmery berry pink was very creamy whilst the matte shades were more powdery but are not too crumbly and easily picked up by a soft and dense long hair makeup brush (I use white goat hair brushes for my blushes and my favourite is the MAC 168 contour blush brush). Blending and layering of the colours was a cinch and helped to correct any accidental mistakes of over colouring cheeks. 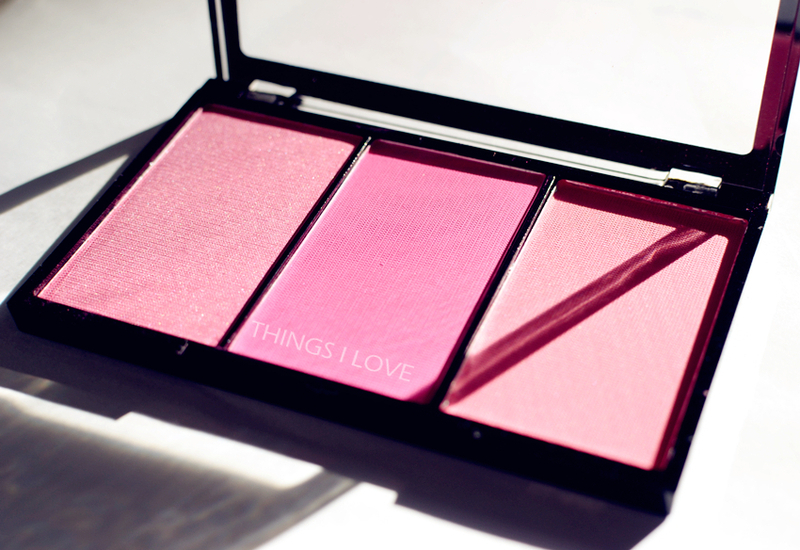 The pigmentation is amazing - all three shades deposit good colour with a single sweep over cheeks and you definitely need to be light-handed to avoid looking too like a tart rather than a naturally flushed goddess. 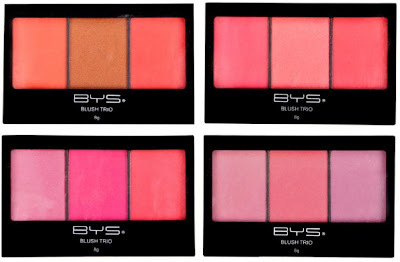 These blushes are also very lasting - I had them on my cheeks in the morning and at the end of the day in the office, the colours are still going strong! 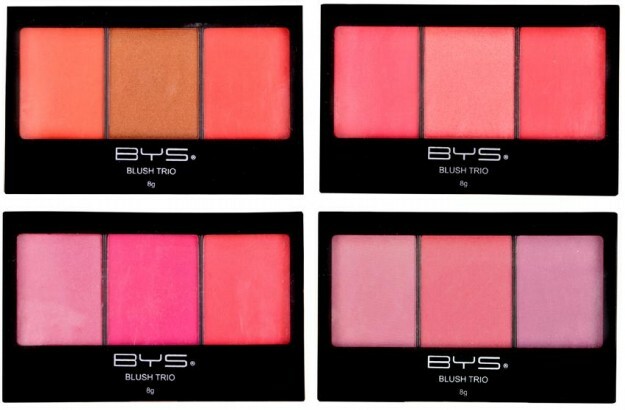 I'm definitely impressed by these BYS blush trios. They are easily truly stand up well against pricier products on the market. The colour offerings are all very versatile and will take you from morning to night without the need to touch up (unless you want to strengthen the colours at night). At the price of $6.95 per trio palette, you can afford to collect them all! Stay tuned for the next post where I do a look using entirely budget-friendly products.